The Parish of All Saints', Millbrook was formed when it broke away from the ancient Parish of Maker in 1869. The Vicars of Maker are recorded back to 1264. Prior to 1869 a Curate served Millbrook from Maker. Before this time there is evidence of a Chapel at Insworke, or Insworth, which dates to the fourteenth century. Little is known of the history of this Chapel but there are remains to be seen today. It is likely that the Chapel was part of Insworke Manor, which was in the possession of the Champernowne family. It is believed that the Chapel was licensed by Bishop Grandisson in 1331 and was probably disused by the middle of the 16th century. Insworke represents one of the oldest areas of habitation and sites of Christian worship in Millbrook. In 1827 a Chapel of Ease was built in the Dodbrooke area of Millbrook. The Chapel had no chancel and the altar stood close to the east wall. The Font was located near the west door under the music gallery. Sometime later the East End of the chapel was extended to form a chancel and choir stalls were added. At about the same time an organ was installed. It is known that the Sunday School children sat in the gallery. There was a three decker pulpit. In 1888 the fabric of the Chapel of Ease became dangerous and the then Vicar of Millbrook, The Reverend G. Farmer and his wife were anxious that a more beautiful Church should be built. They headed the subscription list with a donation of £1,500 requesting that the name 'All Saints' be given to the new Church. This was quite appropriate for a Church at the very eastern end of the Diocese of Truro, which has been called the 'Land of the Saints'. 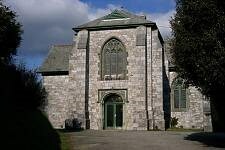 The new Church in Millbrook was built of Limestone. The pillars, window and door jambs of the new Church are of blue stone from a Cornish quarry which was rather unusual in Church architecture at that time. It is polyphant and is used with white Bath stone. The fittings of the new church included items from the old Chapel of Ease. The Altar, Font and lectern, the tables of the Creed, Lord's Prayer and Ten Commandments, and the organ, church bell and various parts of the seating were amongst the items included in the new building. The old altar now stands in the Lady Chapel with the Cross from the old Chapel. The Eagle lectern, which was carved by a local man from Mount Edgcumbe Oak, still exists in the present church. The High Altar was given by the parish, together with the Cross and Candlesticks, in time for the consecration. A White frontal was specially worked for it by some of the ladies of the parish assisted by the Sisters of St. Margaret's at Cawsand. The original design of 1892 for All Saints' Church proposed a building with a fine Tower but this was never completed due to lack of funds. The Bell from the old Chapel was incorporated into the new building however, and is still rung to summon the faithful to prayer and worship. The Memorial Window situated along the north wall is rather beautiful and was dedicated to the memory of those who lost their lives in the Second World War 1939-1945. The names of the fallen are inscribed in a Cornish Slate tablet below the window. The new Church was consecrated by Bishop Gott, the Bishop of Truro, on All Saints' Day, 1st November, 1895. The church is now united with Millbrook and is known as the 'United Benefice of St. John with Millbrook'. The headline coordinates will take you to the War Memorial in the grounds in front of the Church. The GZ offers some nice views across the pool and to the Church - roadside parking near the final cache location is usually available. The cache is a small camo'd tube 10 cms long and 3 cms in diameter. It is attached to a retaining string - please tuck the cache away after signing the log.